Browse The MLM Shop To Fill Your Toolbox. Scroll down to browse the tools that will give you the mindset to succeed. 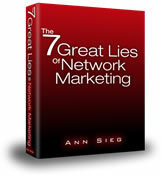 Take "The Way Forward"" for Network Marketing. This ebook explains the potential clearly and succinctly, as well as "how to". Not for limited thinkers...! An honest and candid review of the methods tactics used in the industry - that you will want to avoid! By Anne Seig. A Free Viral program with a unique feature that multiplies the leads you generate, and being free it comes recommended.